The $45 billion military economy in San Diego supports one in five local jobs, and is poised to grow significantly as the Navy moves forces to the Pacific, according to a study released Tuesday. The Defense Department spent $23 billion in the 2016 fiscal year, Reaser said, employing 301,000 people and resulting in an overall $45 billion in economic impact. The military’s economic significance was detailed at a press conference releasing the 8th annual Military Economic Impact Study sponsored by the San Diego Military Advisory Council. Though national military spending has declined from nearly 8 percent of gross national product in 1970 to 3.2 percent today, Reaser said, spending in San Diego has held steady and is poised to grow. The refocus on the Pacific will increase the number of ships home-ported here from 53 to 84 by 2023, potentially adding billions of dollars to the local economy. In addition, Reaser said, San Diego is a center of expertise for special operations, unmanned systems and cyber-security. 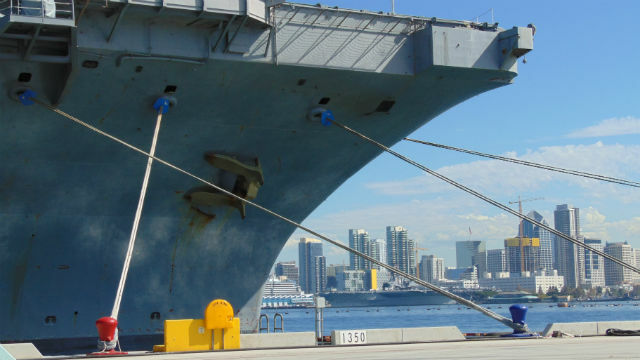 Mayor Kevin Faulconer said San Diego is proud of its connection to the military and cognizant of the sector’s importance. Brigadier General Kevin Killea, commanding general of Marine Corps Installations West, said the San Diego region is an incomparable location for the military, both for training and for housing military families. “The training spaces here in the southwestern United States are absolutely crucial to our readiness,” said Killea.